“I don’t need to teach you Treasurer, what a tax is,” 7:30‘s Sarah Ferguson said to Joe Hockey last night in a grilling interview. And as a result she topped the ABC’s Budget-driven ratings last night at 967,000 viewers. But perhaps if the Treasurer had wanted to reach middle Australia he should have sung for his supper on The Voice. It topped the night once again, along with Nine. Nine network won with a share of 33.5% then Seven 26.4%, ABC 18.8%, TEN 17.1% and SBS 4.2%. The Voice was #1 at 1.72m for Nine then Nine News (1.21m / 1.09m), A Current Affair (1.02m), Joanna Lumley meets will.i.am (992,000), Hot Seat (692,000), and a Nine News budget special (507,000). Seven News (1.17m / 1.04m) led Seven followed by House Rules (1.03m), Home and Away (932,000), Resurrection (782,000). Parenthood wrapped at 335,000 / 201,000. Million Dollar Minute was just 292,000 due to a coding error (it is understood to have actually pulled 511,000). 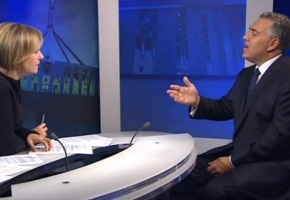 Sarah Ferguson’s 7:30 interview with Joe Hockey topped ABC1 at 967,000 then Budget 2014 (946,000), ABC News (912,000), Two Men in China (585,000), QI (396,000), At the Movies (365,000). The Writer’s Room was 182,000. MasterChef Australia (701,000) remained TEN’s strongest performer then The Project (640,000 / 466,000), NCIS (636,000), TEN Eyewitness News (630,000), NCIS: LA (522,000) and Modern Family (292,000). On SBS ONE it was Great Houses with Julian Fellowes (193,000), Insight (160,000), SBS World News (145,000) and Dateline (142,000). Bogan Hunters was off to a great start for 7mate, leading multichannels at 390,000 -the second best number for 7mate ever. I do not like Sarah Ferguson’s interview style. She constantly interrupts the guest and her questions are more like an interrogation. She’s obviously an ABC leftie in keeping with the rest of the tax payer funded station but she should display more of a neutral approach in her political interviews. She’s aggressive toward the coalition and insipid toward the labor and greens. Also she had an opportunity to expose the total lack of credibility of the incoming senators of the PUP when speaking to the Tasmanian senator to be and let this poor excuse for Australian democracy off the hook. Bogan Hunters did better than I thought it would get. Its ads (and Paul Fenech’s loyal fans) helped it win the night and get a big number for 7mate. Well done for getting the 2nd best numbers for the channel ever. The budget did well for the ABC too. Bogan Hunters was better than expected! I’m still holding out for a third series of Housos. Interesting Studio 10s numbers have dropped. I’ve been watching the show this morning and don’t think much of Kristina Keneally. She doesn’t have the class and polish of Ita and doesn’t seem to fit into the program well, contributing little to discussions.